This coming week Bodies in Flight bring a version of Dream-Walk to Skegness for the SO Festival. (link to Dance4 site) Sporting headphones, audience members are taken on a poetic walk around the town whilst live and pre-recorded text/music/song is mixed in to the everyday soundtrack of the town together with, of course, the sound of the sea. Bespoke versions of Dream-walk have been previously presented in Bristol, Singapore, Nottingham and Wirksworth. Freed from the daily grind for a day, a week or a fortnight in caravan or B&B! Fun in the sun, sea and sand! Bodies in Flight’s seaside walk celebrates the Great British Seaside Holiday. Accessible for any age group, the walk will take you through the heart of Skegness to the beautiful coastline, exploring through a sensory mix of soundscape, movement and performance the funny, intimate and sometimes profound experiences we all have when we holiday by the seaside. The walk lasts 35 minutes. You wil be provided with a headset to experience the specially composed soundscape whilst being guided by the performers along this dream walk. This is an outdoor choreographed walk, so please dress accordingly. As places are limited, please book your place by emailing Kirsten at Dance4 or calling on 0115 941 0773. 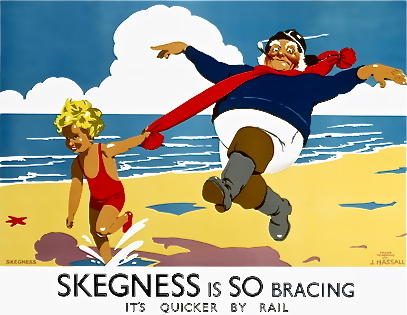 Performances will commence at 12pm, 1pm, 3pm, and 4pm from inside Skegness Station.